Wow… 8 months now that Eden Villa Retirement & Assisted Living facility has been up and running under new ownership and management. The facility that many call home, is located in a picturesque setting in Chatham, ON in a quiet neighbourhood near Tecumseh Park and the Cultural Centre. We have a small resident base of 16 residents at present time and continue to grow as do the challenges and rewards each day. The home is privately owned by London business owner, Jack Vanderweg. Jack and his wife Alice are seen frequently around the home visiting, renovating and helping where ever they can. The quiet, comfortable atmosphere offers care 24/7 through the very caring staff. 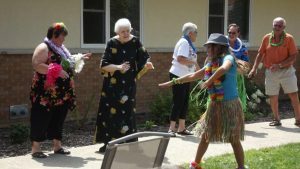 After 8 months our residents, staff and owners and their families were able to enjoy a Hawaiian Luau on Sunday August 21, 2011. There was music featured by Chris Osborne from Essex on the ukulele… playing his rendition of Hawaiian music which found several people tapping their toes, singing to the tunes and yes even dancing the Hula led by owner’s granddaughter, Eden. Amongst those present in this dance formation was a 86 year old lady donning her homemade Moo Moo from when she was younger… assisted to the dance area by myself we had a great time … many laughs and hugs were had by all. After the much enjoyed food , we played games such as bowling with coconuts and water balloon toss and had prizes. The day was thoroughly enjoyed by all. To all who participated we are truly greatful and hope that this may become a yearly event. Please stop by and enjoy the pictures displayed in our front entrance.